For cricket lovers of our generation the following players will always be special – Sachin Tendulkar, Anil Kumble, Sourav Ganguly, VVS Laxman, and Rahul Dravid. We grew up watching these heroes, we grew up watching them fight hard and win matches for India, watching them take Indian cricket to great heights. Especially after the dark clouds of match fixing had threatened the very survival of the game in this country. Kumble and Ganguly have already moved on and now it is Rahul Dravid. I still remember his debut Test at Lord’s in the year 1996. While Sourav Ganguly got all the attention for his well compiled century, for me it was Dravid’s 95 that stood out for its technical brilliance. Lovely strokemaking, so pleasing to the eye. The cover drives, the flicks through mid-wicket, the straight drives, the leg glance, and the ferocious pulls, all grace and elegance. Over the years, Dravid gave his fans lots of reasons to rejoice. The beautiful strokemaking, saving matches from hopeless situations, and winning matches abroad, the last in the list being something the average Indian cricket fan wasn’t used to. Test victories in England, Australia, the West Indies, and South Africa; countries which had spelt death for Indian batsmen for most of the late 80s and the early 90s. Dravid had a big part to play in all these victories. If I had to pick three of my favorite Dravid innings, I would pick the century in ‘The Test Match’ at Kolkata against Australia in 2001, the century at Headingley against England in 2002, and the double century at Adelaide against Australia in 2004. My most enduring memory of Rahul Dravid would be him hitting the winning runs against Australia at Adelaide, taking his cap off, his bat raised towards the dressing room, with a big smile on his face. Probably the nicest guy….no, THE nicest guy I have ever met in International cricket. He commanded a lot of respect not only from his own teammates, but also from the players in the opposition camp. Not something you can say about a lot of players around the world. 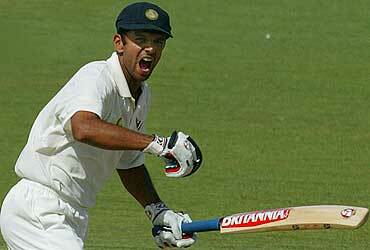 However, for me what defined Rahul Dravid the most was the fact that he was a complete team man. Harsha Bhogle, the articulate Indian cricket commentator, writes in his book ‘The Winning Way’ that the hallmark of a great team player is that he puts the ‘We’ ahead of the ‘Me’. Rahul Dravid did exactly that, throughout his career. When the team needed a good start in seaming and bouncy tracks, Dravid opened the innings. When the team needed a good fielder to stand at forward short leg while Kumble and Harbhajan were bowling, Dravid put his hand up. When the team wanted to accommodate an extra batsman in the XI, Dravid donned the wicket-keeper’s gloves. Tell me how many cricketers would have done that? Around a year back, I had the good fortune of having dinner with Harsha Bhogle and he said that Dravid was the epitome of a good team player. He also mentioned that Dravid was the most aggressive captain India ever had. He always played to win. How many captains would have dared to declare the innings when Sachin Tendulkar was batting on 194? I would like to thank the Indian cricket fans, both here and across the world. The game is lucky to have you and I have been lucky to play before you. To represent India, and thus to represent you, has been a privilege and one which I have always taken seriously. My approach to cricket has been reasonably simple: it was about giving everything to the team, it was about playing with dignity, and it was about upholding the spirit of the game. I hope I have done some of that. I have failed at times, but I have never stopped trying. It is why I leave with sadness but also with pride. That in my view sums it up rather well.